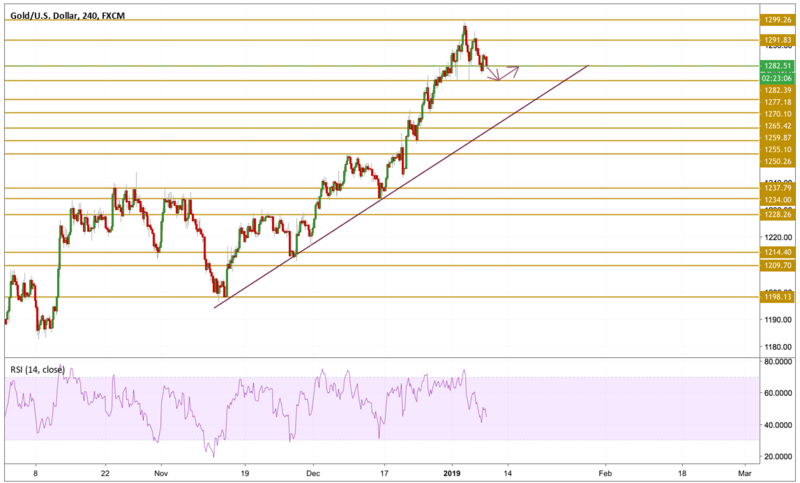 Gold has started to lose some appeal as the Dollar Index gains back some of the ground lost towards the 96 handle alongside an improved sentiment in the equity markets. However, the Dollar will remain vulnerable if the Fed dovishness sticks around for much longer as multiple warnings from Apple's CEO message in regards to last week's flash crash indicates how fragile the optimism in the markets is. Today's Fed minutes following by tomorrow's Jerome Powell's testimony will certainly shape the outlook on the XAU/USD pair. Gold prices' attempt to retreat below the $1280 level was quickly denied by receiving a strong support from this level. However, on the short term, we can not eliminate the fact that the yellow metal has more room to correct to the downside supported by a declining momentum and multiple attempts to break below near support levels. Today we will be watching for a potential retest of the $1280 level and the $1277.2 level in extension.